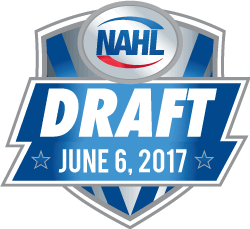 The 2017 NAHL Entry Draft will take place on Tuesday, June 6th at 1pm (central). The draft will be live on nahldraft.com and will be broadcast live on hockeytv.com. Amateur players less than 21 years of age on December 31, 2017 who are not listed on an NAHL team roster or are listed on an NAHL team roster but played less than (10) NAHL regular season and/or playoff games during the 2016-17 season and did not accept a tender from an NAHL team prior to the 2017 NAHL Entry Draft are eligible for selection in the draft. No. If you are eligible for the draft, each team will draft individual players largely based upon scouting throughout the season and/or a team’s needs. Eligible teams shall make selections in each round in reverse order of their finish in the 2016-17 NAHL regular-season standings. New member clubs shall have their order of selection determined by lottery. If there is only one new member club, it shall have the first selection in each round. Players not drafted but who still want to play in the NAHL are encouraged to attend individual team’s open tryout camps.